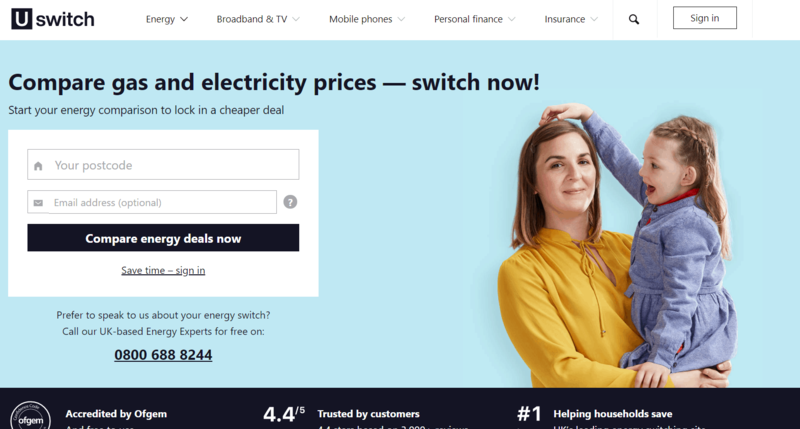 uSwitch Energy Reviews: The Best Electricity & Gas Comparison Site? uSwitch is the leading energy comparison site in the UK. With a range of options available on their website, including broadband and TV, mobile phone contracts, personal finance and insurance comparisons, as well as energy, they offer a comprehensive service for their customers. uSwitch has a 5 out of 5 star rating on TrustPilot, giving them an “excellent” score. In particular they are praised for the service direct from their advisors rather than the online service. In the cases where there is a negative feedback, the main concerns appear to be promises not being kept, such as cashback not being applied or a misunderstanding surrounding the given information. In all cases of poor review, uSwitch representatives offer to get in touch via email to discuss. On FeeFo, uSwitch enjoys a 4.4 out of 5 star rating based on 2,076 reviews over the past year. Customers found the service easy to use and many stated they saved money by using uSwitch. On the Topcashback site, uSwitch has a more than 99% satisfaction rating with almost all people experiencing an easy transaction and getting the expected cash back without any problems. It is described by many as being the best and fastest cashback merchant they had used. As well as worrying about their own customer satisfaction, uSwitch carry out a regular survey of their customers regarding their satisfaction with their energy suppliers. Known as their Energy Customer Satisfaction Report, the survey talks to more than 5,000 customers and asks them to rate their energy supplier across 12 categories. In 2018, Octopus Energy scored best with a 96% satisfaction score, while nPower came in bottom with just 65%. The company offers a comparison service for both domestic and business customers and states on their website that they make their money through the commercial agreements they have with their suppliers. This means there is no charge for the customer and in some cases, means that they can negotiate special deals that are not available direct with the supplier. They work with almost all leading suppliers including British Gas and SSE, was well as a number of smaller suppliers such as M&S Energy. When it comes to energy comparisons, uSwitch are accredited by Ofgem under its Confidence Code, which insists that they offer a reliable switching service that provides reassurance for their customers. Accuracy of information is the cornerstone of this accreditation. Additionally, they are authorised by the Financial Conduct Authority which is an independent body set up to promote good business practice and fair financial markets for the consumer. Finally, the company has been awarded the Internet Crystal Mark by the Plain English Campaign, which rewards those companies that ensure they use simple language and a clear website design. Visitors to the website can take advantage of a huge number of helpful guides, blogs and articles that offer information on saving energy, renewable energy, gas and electricity, boilers and central heating, insulation and much more. The website is also very easy to use with customers expected to simply enter their postcode and energy habits to get a bespoke comparison. The process of switching is easy with the site doing all the work. All switching is covered by the uSwitch Guarantee, with 14 days to cancel if necessary. uSwitch was founded in September 2000 by Lord Milford Haven with an investment of £4m. It was first brought into existence to take advantage of the UK’s deregulated energy markets and soon expanded into mobile and telephones and communications. It subsequently bought buy.co.uk and UpMyStreet.com to further build its empire. Since its inception, the company has been purchased by a variety of companies, but is currently owned by the property firm Zoopla. As well as providing a platform for current energy based news on their own website, uSwitch are prolific press release writers and very often provide insights into the energy markets, research into their customers and a general overview of the energy sector from their point of view. In recent weeks they have warned energy companies about the possibility of being in debt to their energy company due to unseasonably cold weather during August. This story was picked up by various newspapers. The company was also mentioned in this article in The Guardian where the head of regulation at uSwitch condemned the government for sending the message that a price cap might improve the energy market. A further study that highlighted the problem of customers not providing meter readings carried out by uSwitch was also picked up by The Independent and highlighted concerns about underestimation of bills and possible shock bills in the pipeline. Uswitch work hard to ensure they are a qualified and reliable source of information for the media – a job they do very well and is a huge part of their success. uSwitch were one of the first comparison sites and is now the top choice in the UK – for very good reason. With excellent feedback, a simple and easy to use website, plenty of information and an attitude of openness and transparency, the company offers a great service that meets the needs of their customers. While there are some instances of confusion that lead to some poor reviews, these seem to be few and far between and are dealt with professionally by the company. Disclaimer: Power Compare is a uSwitch affiliate. This means if you use their services we may be paid a commission. This does not increase the cost to you, but we feel you should know.